Nicholas Herring’s “The Lives of Milton Acorn” appears in The Fiddlehead No. 277 (Autumn 2018). The following interview was conducted via email with editorial assistant Salar Ghatta in late November 2018. Jeanie Keogh's essay "Somewhere Over Greenland" appears in this fall's Creative Nonfiction issue. What does she "put on when story ideas are hatching"? Jill M. Talbot's essay "Checkmate" appears in The Fiddlehead No. 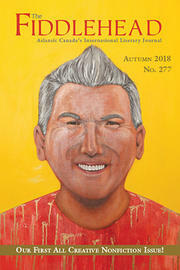 277 (Autumn 2018), our all creative nonfiction issue. odd sundays continues at 2pm on Sunday, December 2. Poets Travis Lane and Steve Luttrell will read at Corked Wine Bar, 83 Regent St. As always there will be an open set and a free book draw. Šari Dale tells us why she recommends listening to Soccer Mommy's 2018 album Clean. Look for Šari's essay "Eulogy for Pale Lilies" in this fall's all-creative nonfiction issue, edited by Alicia Elliott. On November 2, 2018, The Fiddlehead celebrated the publication of a chapbook, Arrivals and Departures: The Stories We Tell, at the Alumni Memorial Building on the University of New Brunswick campus. The title is the first in a new Foraging Chapbook series.The writing originated from a special Writing Workshop for Newcomers to Canada, sponsored by The Fiddlehead in collaboration with The Multicultural Association of Fredericton during Word Feast: Fredericton’s Literary Festival (September 21-22), and led by Anthazia Kadir. It was indeed unfortunate that the weather forces conspired against us on November 4, and that afternoon’s session had to be cancelled. Many people, including our host - Corked - lost power; many still have not had their power resumed. Our hope is that situation will be remedied soon. Douglas Gibson, former senior editor and publisher at McClelland & Stewart and Douglas Gibson Books, will deliver a public lecture entitled “Across Canada by Story: A Coast-to-Coast Literary Adventure” on Monday, 19 November at Memorial Hall on the University of New Brunswick’s Fredericton campus, beginning at 7:30 pm. Read Alicia Elliott's introduction to our Creative Nonfiction issue! The Fiddlehead is proud to present our first-ever Creative Nonfiction issue, edited by Alicia Elliott! Contributors include R.L. Aseret, Tara Campbell, Mary Chen, Šari Dale, Zarrin Darnell-Martin, Tyler Dunning, Gila Green, Nicholas Herring, Mikka Jacobsen, Jeanie Keogh, Ania Mroczek, Dominik Parisien, David Rock, Erin Soros, Jill M. Talbot, Arielle Twist, Charmaine Ward, and Angela Wright. We're excited for you to read it — enjoy!